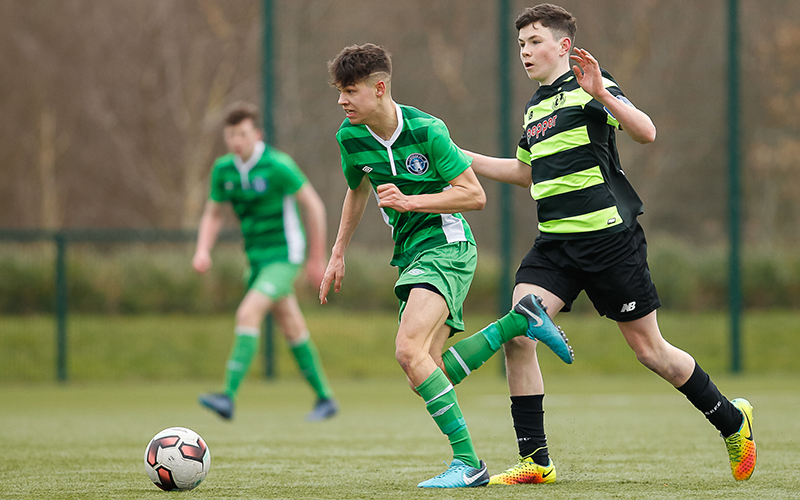 Martins Olakanye popped up with an 80th-minute winner as Limerick were undone late in their SSE Airtricity Under-17 Southern Elite Division opener against Shamrock Rovers, going down 2-1 at UL on a bitterly cold Saint Patrick’s Day afternoon. Listen to head coach John Grehan’s reaction, below. Rovers could have been ahead as early as the fifth minute but for the heroics of Michael Garrihy in the home goal as he produced a top-drawer save to deny Luke Turner following a corner. Turner proved a threat on more than one occasion, and he should have put the visitors in front midway through the first half when he connected with James Clarke’s left-wing cross, but from close in he managed to head over. Danila Bogdanov then got around Garrihy but, driven slightly wide, he saw his shot cleared off the line superbly by Cathal Downes. The second half would produce three goals, the first of them on 52 minutes when Olakanye put in a cross for Conor Behan to head in. Limerick were level from the penalty spot on 70 minutes when Mikey Conlon coolly converted after a foul on Jamie Griffin, who had entered from the bench. But there was a late sting in the tail for the Blues as Jack Kelly’s hard work paid off, the substitute putting it on a plate for Olakanye to finish in the centre. Limerick had Garrihy to thank for keeping them level early on as he pulled off a brilliant save to deny Turner’s header from a corner, the ‘keeper showing a strong hand to push the ball away. At the other end, Filip Mostowy was central to the young Shannonsiders’ early attacks, and after he was fouled outside the box, Brian Ahern sent the resulting free-kick over. Mostowy was heavily involved in a good passing exchange soon after, but at the end of it the midfielder could not connect properly with an attempted shot. Thomas Hannon then fired a free-kick narrowly over from 20-yards for the Hoops, who should have been ahead on 24 minutes. Clarke did well down the left and his pinpoint cross was onto the head of Turner at the back post but with the goal gaping he headed over from close in. Then, Clarke put in another good delivery, this time from a free-kick on the right, and he again picked out Turner but this time under pressure he directed a header off target. 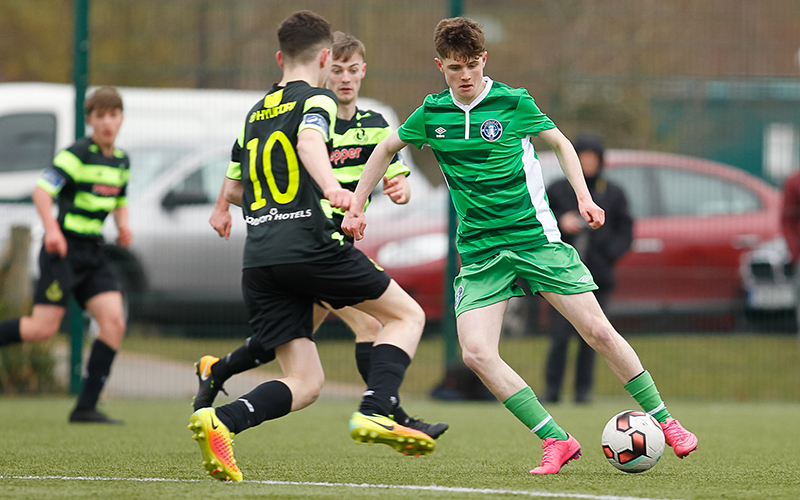 Limerick survived another scare on 28 minutes when Bogdanov got around the ‘keeper and, though pushed wide, his effort appeared goal-bound only for Downes to get back and produce a last-gasp block. But, seven minutes into the second half, Rovers had their lead. Olakanye got down the left and cut back before delivering a cross which left Behan the simplest of tasks to head in from six yards. On 70 minutes, Limerick were back in the game. Substitute Griffin got into the box and he was adjudged to have been fouled, with Conlon stepping up and blasting in from the spot to level the scores. However, that joy was short-lived as Rovers restored their lead and ultimately claimed victory ten minutes from time. Substitute Jack Kelly did well to get to the ball before it crossed the by-line and he squared it for Olakanye to fire in. That was the decisive moment as Limerick started the season with a disappointing result, but the management team will have taken positives from a battling performance. Limerick: Michael Garrihy, Jake Dillon, Eoin Guerin ©, Cathal Downes, Dean McNamara, Brian Ahern, Filip Mostowy (Jamie Griffin 50), Tony Mambouana, Seán McGrath (Ronan Geary 59), Dylan Cody, Mikey Conlon (Ben Coleman 79). Goal: M Conlon (70 pen). Booked: T Mumbauana (7). Unused Subs: Seán Hamm (GK), Stephen Talty, Scott Kirwan. Shamrock Rovers: Gavin Bazunu, Alex Dunne, Andrew Spain © (James Furlong 81), Cian Kelly, Martins Olakanye, Emmanuel Odeniyi (Jack Kelly 66), Conor Behan (Dean McMenamee 75), Thomas Hannon, James Clarke, Luke Turner, Danila Bogdanov. Goals: C Behan (52), M Olakanye (80). Booked: T Hannon (40). Unused Subs: Shane O’Rourke (GK), Jordan Tallon.